Quinoa and black beans: Two of my all-time favs joined as one. Gracing your plate with quinoa is probably the best thing E V E R! 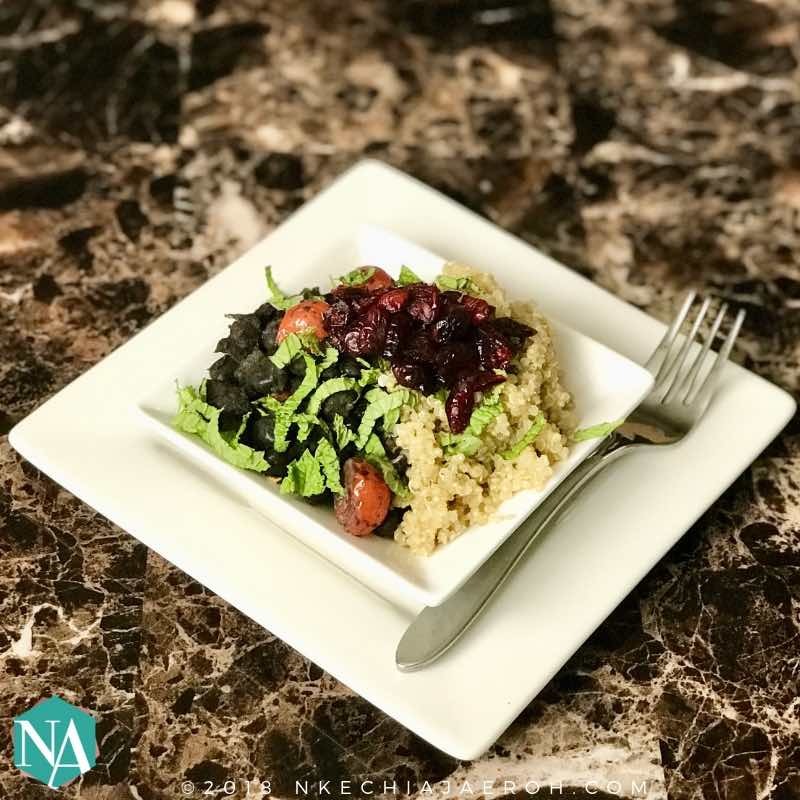 Off course you already know what quinoa is unless you are living on another planet such as “not paying attention.” To put it differently, you have truly been missing out on healthy healing food if you haven’t been eating quinoa. In fact I feel like the world is on quinoa revolution right now (like avocado). OK, aside from the talk, the noise, trend, surrounding quinoa, this food is truly a blessing and great for you and your health. Generally, there three types of quinoa easily available in the market place: red, white, and black; they are also whole grain and gluten-free. Quinoa is protein, has high fiber, contains iron, it is a great antioxidant, and can prevent kidney stones. Do you need another reason to get this on your plate? Surely, quinoa can save life. Also, black beans is the BEST! It is no secret that I love LOVE beans, and even though I typically ate black-eyed peas and brown beans growing up, I also have embraced black beans since coming to live in America. In fact my love story with black beans started when I was pregnant for my daughter. And since then I have never looked back! It is important to realize that black beans like many foods can be cooked in different plenty ways, in other words this is just one of the ways that I make my black beans. Moreover, there are equally different varieties of beans in the market namely black-eyed beans, navy beans, pinto, red kidney beans and so on. By the same token, they have tons of benefits as well. Black beans are naturally low in sodium and high in potassium so they have the capacity to lower blood pressure. Click To Tweet Also, they are great for managing diabetes and maintaining healthy bones as well as have the ability to support the body during weight loss due to it high fiber component. Black is a winner, incorporate it in your healthy meal planning this year and beyond. To emphasize, these two combos are the best’s BEST! You cannot possibly go wrong with black beans and quinoa; healthy eating starts here. RIGHT NOW! I enjoy the crunchiness of toasted sliced almonds on here. Try it and let me know. While I get on this meal, grab the recipe and go make them for yourself. Quinoa and black beans combo are the best; they are both delicious and nutritious! You cannot possibly go wrong with them. You can switch up the garnish; use bell peppers, scallions, or parsley instead of mint leaves. Place 1 cup of quinoa in a colander and wash in cold water. This will ensure that the quinoa does not slip out as you wash them. Quinoa can easily slip through your finger. Then leave on a colander so that it will continue to drain. Add 2 cups of chicken broth to the pan and set the stove on medium; allow to boil then add washed quinoa and a bare leaf cover and cook for 15 minutes, and then turn off stove and allow it to sit/rest for another 5 minutes. And it is ready to be served with black beans or any other thing. Wash beans and soak overnight (or for about 12 hours, you can definitely cook it without soaking it; but I loved it this way:) The following day or after 12 hours rinse very well and add to a clean pot, add 3 cups of water, 1-teaspoon salt and seasoning cubes, cover and cook for 50-60 minutes; the beans should have almost absorbed the water by this time. Then, turn off and set aside. Place another clean pot on stove and allow to warm up, add vegetable oil, and allow it to heat up just a little bit and add a dash of salt, chopped onions and garlic. Sauté for about 1- 2 minutes and add chopped tomatoes, then curry and dry thyme. Reduce the heat to low to avoid burning. Sauté for another 2 minutes, and then stir in all the beans, and gently give a good stir. Allow to cook for another 2 minutes, so that all the flavors would infuse the beans. (Do not over stir; your goal is not turn this into a porridge.) Taste and adjust flavors accordingly as desired. Turn off stove; sever with quinoa. Top with cranberries for sweetness and garnish with mint leaves, and almonds for a little crunch. Soaking the beans is optional but I love it that way. Do you eat quinoa? How do you cook them? Please feel free to share with our community in the comment. Please share out this post after reading let's promote healthy eating together. Also, come hang out with the family and get exclusive healthy tips, recipes and MORE for living your best healthy life! Be sure to check out our other fantastic recipes before you leave.